I was having a hard time coming up with a photo depicting anger. Then in the middle of doing laundry I realized I had photos depicting anger. 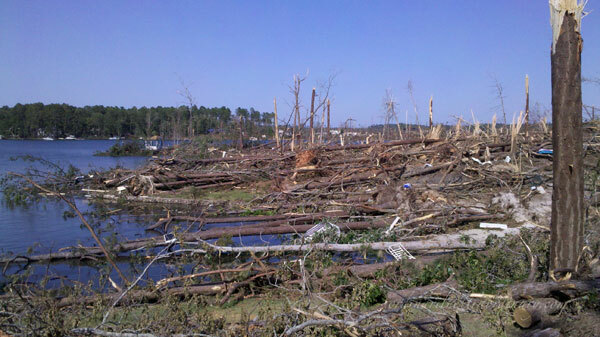 Photos of the destruction caused by the tornadoes of April 27. My husband took these photos with his phone. Trees that once lined the shores of a beautiful lake now gone. Yes, this photo speaks of anger to me. I know nature doesn’t have emotions, but it’s hard to look at photos from the damage and not think that it was angry as it ripped through our state. Linking up with xoxo, Trina for Photo Friday. I thought about an angry storm too! But I didn’t have any of my own photos to share of the aftermath. I think yours is perfect for this theme. I agree that this photo appears angry. Several years ago a strong storm with awful “straight-line winds” wiped out thousands of trees in the Boundary Waters Canoe Area in northern MN. It was so tragic and the photos showed anger and destruction.